Your journey takes you from the forgotten catacombs beneath the subway to the desolate wastelands above, where your actions will determine the fate of mankind. But what if the real threat comes from within? 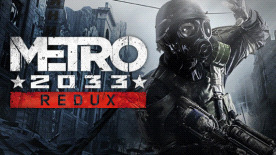 Product Overview Metro 2033 Redux is the definitive version of the cult classic ‘Metro 2033’, rebuilt in the latest and greatest iteration of the 4A Engine for Next Gen. Fans of the original game will find the unique world of Metro transformed with incredible lighting, physics and dynamic weather effects. Newcomers will get the chance to experience one of the finest story-driven shooters of all time; an epic adventure combining gripping survival horror, exploration and tactical combat and stealth.